Colorado Four O’clock is one of my prettiest wildflowers. It usually starts by July, but it’s bloom season is tied to my summer monsoons, which were late this year. This is not my biggest or prettiest Colorado Four O’clock, but it is the first to bloom this year. I have collected seed all four years and have dozens of these now, all children one against my front fence. When it starts blooming, I will post a photo, it is my oldest and largest one. 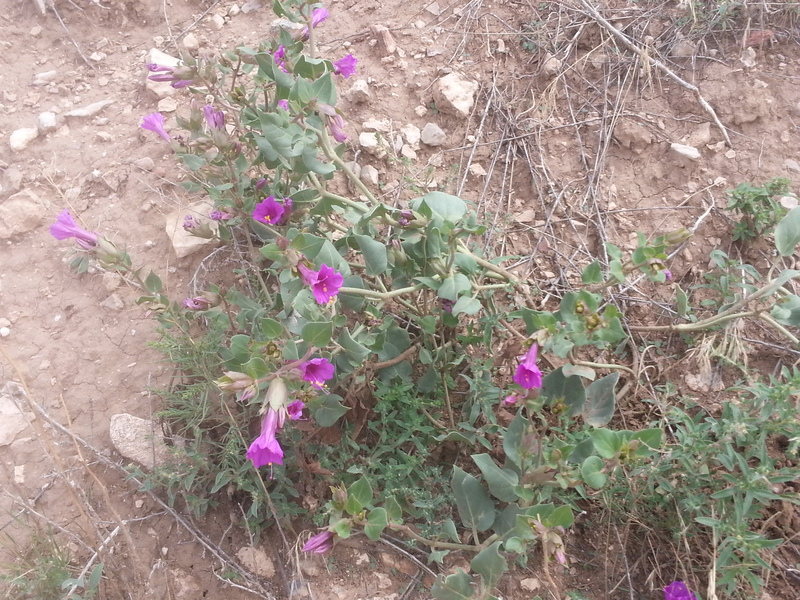 The purple petals are not flowers, but sepals fused together. It is generally pollinated by our hawkmoths. I have seen conflicting information on Four O’clock’s cold hardiness, but guess zones 4-8/10. Mine are in zone 5/6. It will survive 10 to 30 inches of rain per year, give it good drainage. The one in the photo is on about a 70 degree slope at 12 inches annual rainfall. Not a high maintenance plant. I would not call it an edible, although First Americans ground roots into flour and added it to their bread. It is an appetite suppressant and was used during lean times to reduce hunger. It does have a number of medicinal uses, mostly from tthe root but also the seed and leaves. The root is an entheogen, and causes visions. The root is chewed and the liquid swallowed. The root powder is also antiviral and antifungal, and used to ttreat herpes, influenza, upper respiratory infections, hepatitis, yeast and candida. I did not find dosages, but root infusions and tinctures were mentioned. A root decoction can be used to treat wounds and skin diseases, and was used on leprosy. Colorado Four O’clock is a fairly strong medicinal herb that I don’t suggest using without experienced direction. The seeds, at least, can cause abortion so pregnant women should avoid this plant. While outside I dug another bucket of Iris and will prepare more Orris Root for drying. I will dig one of the Colorado Four O’clock plants and dry the root for my pharmacopeia. This entry was posted in Circular Economy, food forest, gardening, medicinal plants, permaculture, Prepper and tagged circular economy, Colorado Four O'clocks, food forest, gardening, herbal medicine, Mirabilus multiflora, native gardening, native plants, New Mexico, Permaculture, prepper, Santa Fe, water conservation. Bookmark the permalink. Interesting how many plants can be used as a source of flour: I’ve been reading about the fruits of the doum palm in Egypt, which have been used since ancient times for the same purpose, often for making bread. Was it used chiefly for its appetite-suppressant properties, or did the first Americans chew the root for its hallucinatory properties? A bit like qat, whose leaves are chewed by Yemenis, perhaps? Exactly! There is so much concern about the narrowing of our food diversity and starvation. Over 20000known edible plants, we need to start eating more locally. I am not positive but I think this root was most used raw and chewed for hallucinatory effect. It was dried and ground to extend flour but to make people less hungry. I read it does not have any known bad effects. I have read about Kat. I think it is similar. Sorry about the spelling, spell check would not allow me to add it. Also, flour is a source of bulk calories a hard thing to get enough calories all year. Flour stored well.